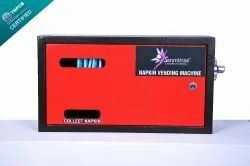 Leading Manufacturer of automatic sanitary napkin vending machine, manual napkin vending machine, electric sanitary napkin vending machine, sanitary napkin vending machine and sanmitra sanitary napkin vending machine from Coimbatore. 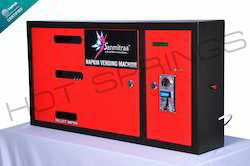 We are offering Automatic Sanitary Napkin Vending Machine. LCD displays available stock, product price, inserted coin value, balance required and a thank you message after each successful transaction. The inappropriate coin is not accepted. If a high-value coin more than what is needed as balance is inserted, the coin is returned back. If there is no stock in the machine, it will not accept coin and once napkins are loaded in the machine, he starts accepting the coin. If product not filled in the appropriate spiral it will vend again automatically till the time a napkin is dispensed. 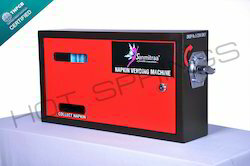 We are offering Electric Sanitary Napkin Vending Machine. The user can vend napkins just by inserting a token provided by us. This machine will be useful to provide napkins at schools at free of cost but the count can be under control. 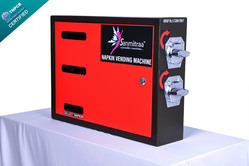 We offer Sanmitra Sanitary Napkin Vending Machine.